Draft: 2013, New York Yankees, 10th rd. Graduated from Northampton (Va.) High School where he lettered in baseball and was rated the No. 6 high school player in Virginia...Pitched for the University of South Carolina compiling a career record of 15-7 in 110 appearances with 20 saves over his four-year career...Played on the 2010 and 2011 National Championship squads which closed out Rosenblatt Stadium and opened the new TD Ameritrade Park...Left South Carolina as the school leader with 110 career appearances...Ranked T-7th in NCAA Division 1 with 17 saves in 2013...Was a teammate of current Cardinals infielder Max Schrock on the 2013 South Carolina team...His father, Kirk, pitched for Old Dominion University...He and his wife, Lauren, reside in Columbia, South Carolina. Was claimed off waivers from San Diego on June 29 and optioned to Memphis (AAA)...Appeared in a career-high 22 Major League games in 2018, 18 with St. Louis and four with San Diego...Made Cardinals debut (7/29) with 2.0 scoreless IP against the Cubs...Was optioned to Memphis (AAA) following the game...Did not allow a run in his first eight appearances with St. Louis (7/29-9/2) covering 10.0 innings...Did not yield an earned run against N.L. Central opponents in nine appearances (8.0 IP) in 2018...Made six appearances against the Dodgers, his most against any opponent in 2018...Did not record an out on 9/15 vs. LAD, his first career MLB appearance (26 app.) without recording one...Recalled on 9/1 from Memphis (AAA) with RHP Daniel Ponce de Leon and C Carson Kelly (his third stint w/ St. Louis)...Pitched a career-high 3.0 innings as a member of the Padres vs. LAD (4/18), allowing no runs...Received his first career ejection from home plate umpire Adam Hamari at KC (8/12) after a hit by pitch of batter Jorge Bonifacio following two strikeouts in the bottom of the 9th inning...Appeared in 30 games between El Paso (SD) and Memphis (STL); 1-1 record with a 2.16 ERA in 41.2 IP with 49 strikeouts...Made one spot start for Memphis vs. Colorado Springs (7/22), pitching 3.2 scoreless innings in a no decision; his first start since 2016 while with Scranton Wilkes-Barre...Held opposition scoreless in 9-of-11 appearances with Memphis...Stymied right-handed batters at Memphis allowing just three singles and an .073 BA (3-41) with 16 strikeouts. Attended spring training as a non-roster invitee with New York (AL)...Spent entire season with Triple-A Scranton-Wilkes Barre, where he led the team in appearances...Went 4-2 with a 2.65 ERA (54.1ip/16er) in 31 relief appearances and 1-2 with a 4.50 ERA (24.0ip/12er) in five starts...Limited left-handed batters to a .215 average (17-for-79)... Went 1-0 with a 1.74 ERA (10.1ip/2er) in six appearances in April...Faced two batters in 0.1ip and recorded his first win on 4/17 vs. Syracuse... Worked 1.1 scoreless innings and recorded his only save of the season on 5/18...Made three consecutive starts between 5/28 and 6/7...Returned to the bullpen on 6/12 and made 19 of his last 21 appearances in relief... Made final start on 8/18...Was selected by Pittsburgh in the Major League Phase of the Rule Five Draft during the final day of the winter meetings on 12/8; became the first player the Pirates selected in the Major League Phase of the Rule Five Draft since Gustavo Nunez in 2011. Worked exclusively in relief while spending entire season with Scranton-Wilkes Barre...Limited left-handed batters to a .217 average (13-for-60)...Recorded a 1.29 ERA (14.0ip/2er) while recording 15 strikeouts and allowing just one walk in his final 11 appearances...Ended the season with a 10.1 scoreless inning streak...Went 2-0 with a 5.84 ERA (12.1ip/8er) in nine relief appearances for the Surprise Saguaros of the Arizona Fall League following the regular season. Produced a 3-6 record, 12 saves, a 3.80 ERA (68.2ip/29er) and a career-high 94 strikeouts in a total of 48 relief appearances between Single-A Tampa, Double-A Trenton and Scranton-Wilkes Barre...Was named to the Eastern League mid-season All-Star team...Ranked second among Yankees farmhands in saves...Led Yankees minor leaguers (minimum 60.0ip) with a 12.32 strikeouts/per 9.0ip ratio. Began professional career with the Staten Island Yankees of the New York-Penn League after being selected by New York in the 10th round of the draft earlier in the summer...Did not allow a hit in a total of 5.0 innings (16 at bats) over four appearances with Staten Island...Was promoted to Charleston of the South Atlantic League on 6/29 for the remainder of the season. April 7, 2019 St. Louis Cardinals recalled LHP Tyler Webb from Memphis Redbirds. 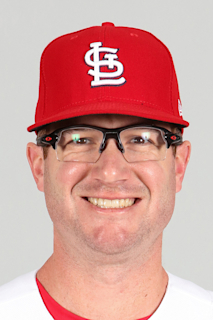 March 26, 2019 St. Louis Cardinals optioned LHP Tyler Webb to Memphis Redbirds. September 1, 2018 St. Louis Cardinals recalled Tyler Webb from Memphis Redbirds. August 15, 2018 St. Louis Cardinals optioned Tyler Webb to Memphis Redbirds. July 31, 2018 St. Louis Cardinals recalled Tyler Webb from Memphis Redbirds. July 30, 2018 St. Louis Cardinals optioned LHP Tyler Webb to Memphis Redbirds. July 27, 2018 St. Louis Cardinals recalled Tyler Webb from Memphis Redbirds. July 2, 2018 Memphis Redbirds activated LHP Tyler Webb. June 29, 2018 St. Louis Cardinals claimed LHP Tyler Webb off waivers from San Diego Padres. June 29, 2018 St. Louis Cardinals optioned LHP Tyler Webb to Memphis Redbirds. June 24, 2018 San Diego Padres designated LHP Tyler Webb for assignment. May 29, 2018 San Diego Padres optioned LHP Tyler Webb to El Paso Chihuahuas. May 21, 2018 San Diego Padres recalled Tyler Webb from El Paso Chihuahuas. April 20, 2018 San Diego Padres optioned LHP Tyler Webb to El Paso Chihuahuas. April 17, 2018 San Diego Padres recalled Tyler Webb from El Paso Chihuahuas. April 14, 2018 San Diego Padres claimed LHP Tyler Webb off waivers from Milwaukee Brewers. April 14, 2018 San Diego Padres optioned LHP Tyler Webb to El Paso Chihuahuas. April 7, 2018 Milwaukee Brewers designated LHP Tyler Webb for assignment. March 9, 2018 Milwaukee Brewers optioned LHP Tyler Webb to Colorado Springs Sky Sox. October 2, 2017 Milwaukee Brewers recalled Tyler Webb from Colorado Springs Sky Sox. July 18, 2017 Milwaukee Brewers optioned LHP Tyler Webb to Colorado Springs Sky Sox. July 14, 2017 Tyler Webb roster status changed by Milwaukee Brewers. July 13, 2017 New York Yankees traded LHP Tyler Webb to Milwaukee Brewers for 1B Garrett Cooper. June 27, 2017 New York Yankees recalled LHP Tyler Webb from Scranton/Wilkes-Barre RailRiders. June 26, 2017 New York Yankees optioned LHP Tyler Webb to Scranton/Wilkes-Barre RailRiders. June 22, 2017 New York Yankees selected the contract of Tyler Webb from Scranton/Wilkes-Barre RailRiders. April 15, 2017 LHP Tyler Webb assigned to Scranton/Wilkes-Barre RailRiders from Trenton Thunder. April 13, 2017 LHP Tyler Webb assigned to Trenton Thunder from Scranton/Wilkes-Barre RailRiders. April 1, 2017 LHP Tyler Webb returned to New York Yankees from Pittsburgh Pirates. April 1, 2017 LHP Tyler Webb assigned to Scranton/Wilkes-Barre RailRiders. December 8, 2016 Pittsburgh Pirates claimed Tyler Webb off waivers from New York Yankees. February 5, 2016 New York Yankees invited non-roster LHP Tyler Webb to spring training. September 28, 2015 Scranton/Wilkes-Barre RailRiders activated LHP Tyler Webb from the 7-day disabled list. June 25, 2015 Scranton/Wilkes-Barre RailRiders placed LHP Tyler Webb on the 7-day disabled list retroactive to June 24, 2015. February 5, 2015 New York Yankees invited non-roster LHP Tyler Webb to spring training. July 16, 2014 LHP Tyler Webb assigned to Scranton/Wilkes-Barre RailRiders from Trenton Thunder. May 4, 2014 LHP Tyler Webb assigned to Trenton Thunder from Tampa Yankees. April 3, 2014 LHP Tyler Webb assigned to Tampa Yankees. March 13, 2014 LHP Tyler Webb assigned to New York Yankees. June 29, 2013 LHP Tyler Webb assigned to Charleston RiverDogs from Staten Island Yankees. June 17, 2013 Tyler Webb assigned to Staten Island Yankees. June 16, 2013 New York Yankees signed LHP Tyler Webb.